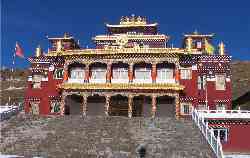 Dzogchen Monastery (Tib. རྫོགས་ཆེན་དགོན་པ་, Wyl. rdzogs chen dgon pa), Rudam Orgyen Samten Chöling, one of the Six "Mother" Nyingma Monasteries of Tibet, was founded by Dzogchen Pema Rigdzin (1625-1697) in 1675 (according to the Great Tibetan Dictionary) or 1684 (according to Jamyang Khyentse Wangpo). It became especially renowned for its Shri Singha Shedra established by Gyalsé Shenpen Thayé during the time of the Fourth Dzogchen Rinpoche Mingyur Namkhé Dorje, shortly after the monastery was almost totally destroyed by an earthquake in 1842. Among the great masters to have lived and taught at Dzogchen are Khenpo Pema Vajra, Patrul Rinpoche, Mipham Rinpoche and Khenpo Shenga. During the time of the Fifth Dzogchen Rinpoche (1872-1935), Dzogchen Monastery was at the peak of its activity, with up to five hundred monks residing, 13 retreat centres, and an estimated two hundred and eighty branches - a gathering of which would have seen tens of thousands of lamas, tulkus, khenpos, monks and nuns. Throughout the year, an extensive array of complex ritual ceremonies were accomplished. Dzogchen was also one of the most famous centres of sacred ritual dance, now commonly known as lama dancing. Its main temple was destroyed by fire in the second month of the Fire Mouse year (1936). It was rebuilt and then the whole monastery was destroyed by the Chinese in the late 1950s. 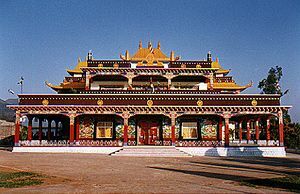 Now firmly re-established at the Dhondenling Tibetan settlement in Kollegal, South India, Dzogchen Monastery is the official seat of the seventh incarnation of the Dzogchen Rinpoche. In December 2000, His Holiness visited the monastery and settlement bestowing teachings and blessings for the lamas, monks, nuns, people of Dhondenling and others who had travelled from throughout all parts of India, Nepal, Australia, Europe, Singapore, the USA and Canada. At the busiest times during the visit up to 10,000 people gathered. This page was last edited on 27 September 2012, at 10:52.